Black and white photo taken at the train station in Moncton, New Brunswick. This was the first group to leave the Maritimes, headed for Ajax Defense Industries Limited. 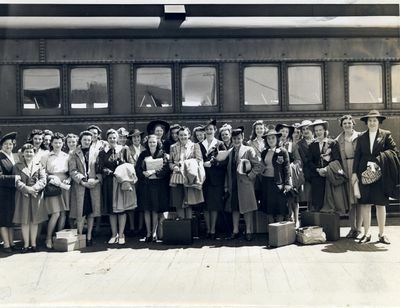 Marie (Lannigan) Lawrence, from Cape Breton is in the front row, 4th from the left, gift boxes at her feet, with her friend Margaret Dickson behind her.